Yeah, this site is Bob in the USA, but today I will be featuring my son, Chris. Chris is 27 years old. He is a great guy, very popular with everybody that he meets, it seems. In fact, when Chris was young, Feyma and I would always joke with each other that Chris would be a politician someday. A lot of people don’t know this, but our original move to the Philippines had a lot to do with Chris. Chris is mentally retarded. He has a learning disability. When Chris was young, Feyma and I learned that raising a disabled child is a full-time job or more than that. You need a lot of support in handling a situation like that. I come from a relatively small family, and honestly, my family really did not have the time to assist a lot with Chris. I am not mad about that, it just is what it is. 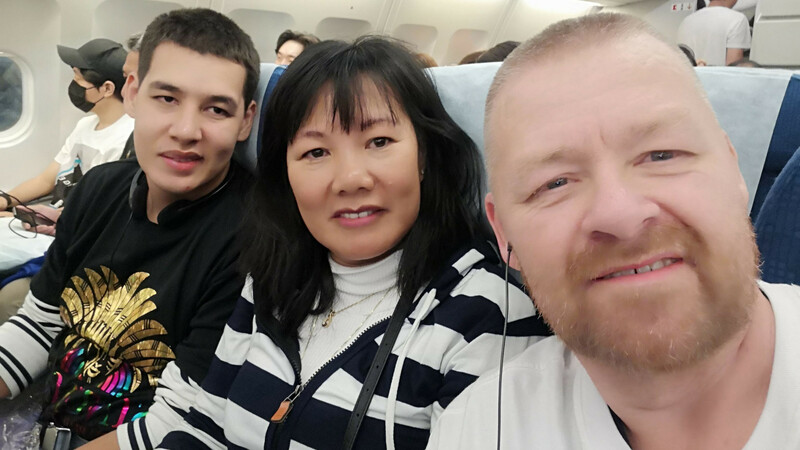 Although we had an interest in living in the Philippines, the fact that we had a large extended family in the Philippines who were willing to assist with Chris was a huge factor in the decision. This extended family in the Philippines offered great help and assistance for us and for Chris. As Chris became an adult, we started realizing that the Philippines offers little for a disabled person. It would be more or less impossible for Chris to get a job. He even had few friends in the Philippines, mostly just family. Frankly, I never even thought about Chris getting a job because basically, it was not possible in the Philippines, where we lived. However, when we started considering moving back to the USA, my friend told me that the company he works for would likely hire Chris. That really finalized the decision both to move and also where we would move. 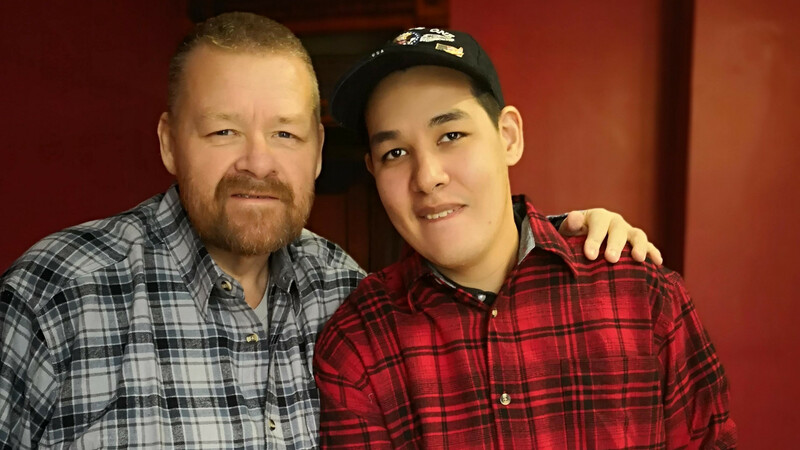 Within a few days after our arrival in the USA, Chris and Feyma went to Tyson and applied for a job. They were hired within a couple of days. Very easy, no muss, no fuss. I was amazed and happy for both Chris and Feyma. Mostly for Chris, though. Feyma, I knew, would have no problems getting work. For Chris, getting a job was literally a life-changing event. When Chris and Feyma started their Orientation and Training at Tyson, we were still a little worried about Chris. How would Chris adjust to working? How would Tyson react to Chris? Would Chris be able to do the things that Tyson assigned him to do? These were concerns. Having a job has been a huge thing for Chris. He is so happy and proud. You can see the pride and self-worth in his face. He feels that he is needed by Tyson to do the jobs they give him. He is also treated well by the company and his co-workers alike. Chris looks forward to going to work every day. He is tired when he gets home, but proud. I am also very proud of him! How has Tyson reacted to Chris? Fantastic. They treat Chris so well! The other day, his boss went to him and asked if they could have lunch together. So, they had lunch, shared each other’s food, talked and had a good time. In fact, at the end of the lunch, the boss asked Chris if they could eat together the next day as well! I told Chris that if he keeps it up he might be the “big boss” of the plant someday. He smiled. Additionally, Chris has so many friends at Tyson now! The other day, we went to Walmart around midnight to buy our groceries. We liked to go at that time because it is not busy and it is quick and easy to get the shopping done. Well, that is right around the time that the second shift gets off at Tyson. We started seeing a lot of Tyson workers come into Walmart and they all came over to talk to Chris, say hi, give him a high-five, etc. It was really touching and made me feel good to see how well, how loved Chris was! Can Chris do the job? Well, I am not there to see, but from all indication, Chris is doing well at Tyson. Feyma and I are so proud of him and he is proud of himself too. I believe, based on the way things are going, that Chris’s position is secure at Tyson. That will be good for him, very good. He is becoming more normal, meaning that he fits into society here more than he was able to in the Philippines (as an adult). Last week when Chris got paid for the first time, it was like he didn’t even realize that he would get money for working at Tyson! He couldn’t believe it that he had his own money and the amount of money he had after working for just one week. It was really a good feeling to see him when he realized that he got paid! His pay was a direct deposit onto a debit card. The next day, I took his debit card and got some cash for him. He was so happy to have some dollars in his wallet. From time to time he would get his wallet out of his pocket, take the money out and just look at it! It was still so amazing to him that he was actually getting money by working. Haha. Made me feel so good. So, anyway, that is how Chris is doing in the USA. Honestly, he is really flourishing here. He is becoming a different person, a better person. He has so many friends, a job, and a very normal lifestyle! I’m proud of you Chris. Moving here was worth it big time for me, just seeing how you are doing. Doing the right thing for my family is always worth it! Thank you, Peter. I will pass that along to Chris. Thank you, Mark, Chris will appreciate that. I think you are right, Tyson seems to be a good company to work for. Fantastic Bob! Great to hear. From what I recall Tyson is a pretty decent company to work for as well. Tell him Congratulations. This post makes my heart so very happy. He always was such a sweet kid and I have no doubts that he will do well. May God continue to bless you and your family. ❤️ Welcome home! Thank you so much, Sandy. We always did appreciate everything that you did for Chris when you were his teacher. Chris still remembers you fondly. Bob, so glad that you are here in States. I’m glad for the sake of Chris that you’re here. And hopefully you are aware that he has gone to work for a very very large company which is such a good company to work for, more than likely, owing to the fact that it is one of America’s largest Christian owned companies. Like Chick-fil-A it has a strong Foundation of respect and love for its employees. Chris will do fine as will Fema. Yes, Tyson has treated Chris very well, we are very happy with his job there! Both he and Feyma are liking their jobs, earning good money, and enjoying the co-workers they have there. This all adds up to a good move, and happy parents. Great story and happy for Chris. Hey, that would be okay! Part of his process I’m becoming more mature. I have noticed that, here in the Philippines, disabled people act like, and are treated like “normal” people. In fact, I was just discussing this with my partner after a fully-functioning Downs Syndrome girl got on and off the jeepney just fine. In the US, she would’ve been treated like a vegetable, ASSUMING she was even allowed to be out in public (don’t want to upset people now, do we…)! I grew up with a learning disability in the US. I’m ambidextrous, so I’ve always been dyslexic; yes, I still am Yet, it’s never been a “disability”. In fact, I’ve always found it to be a blessing in disguise. I can read signs no matter which way they are positioned (I can even sit across from someone who’s writing and reading what they’re writing 😂), and I can read signs, posters and banners from the wrong side! In the US back when I grew up, no one understood learning disabilities. So, the way teachers usually handled dyslexia was by saying, “you’re not concentrating enough!”. word puzzles, and, occasionally recognize patterns to break codes). Despite the PWD program, disabled people in the Philippines are just treated like regular people who simply cannot learn as quickly as others, so more time is taken with them to help them either catch up, or to be the best they are capable of being. In any case, THEY ARE CONSIDERED TO BE MEMBERS OF SOCIETY AND THE HUMAN RACE! In the US, however, everything has become a labeling factory. Everyone is given a classification based on old, untrue stereotypes, and, usually, they can never get out of the little boxes society shoves them into! In fact, the only difference between how disability is treated in the US as opposed to Germany around WWII is the US allows them remain alive, whereas back then in Germany, “imperfect” children were not allowed that option. Unfortunately, not much more is offered than that. Parents have to search out ways to get assistance to handle a “special needs” child. Lucky for you the Philippines was an option! The late comedian George Carlin said it best. Our society is full of antiseptic euphemisms which conveniently hide the truth and prevent dealing with a problem. Janitors are “Sanitary Engineers”, housewives are “Domestic Engineers”. Disabled children and adults are “Special Needs”. Those with learning disabilities are “Intellectually Challenged”. All the names do is serve to ignore a problem so it never gets handled. You were right to move to the Philippines because Chris would never have received the assistance he needed in the US. Third world country or not, there are many times when the Philippines is much more civilized than the so-called First World Nations! That’s one of the main reasons I’m here now. A lot of the attitudes here are similar to those in the US 5-6 decades ago, AND THAT’S A GOOD THING! Thank you very much, Kate. I’m glad that you found it an interesting article. I remember reading quite a while ago why you initially moved to The Philippines. At first mention that you were contemplating moving back to the USA I thought maybe it was related to a decline in income from your online businesses. I am happy to learn the reason for moving back to the USA had more to do with family matters than income. I am very happy for all of you and especially Chris. I think he will really thrive here and secure a good future for himself which is not always so easy in The Philippines. I wish all of you the best in settling in. Hi Bob, thank you for your comment. there were a multiple number of reasons why we decided to move, but this was the main one. Really none of our reasons had anything to do with the income though. I really understand Bob when I was growing up I was put in a institution and my stepmother she thought that I had a problem. So I did have a problem and it was my stepmother and her kids. I was 16 at the time and running away and causing problems with by father and my stepmother so she decided to put me in that institution because they thought I was insane I found God when I moved Oklahoma then moved to Tennessee after moving back to Oklahoma I start driving truck and later on in life I’ve learned to cope with myself. I knew I had problems I know there was things wrong with me my speech was slurred I wouldn’t smart but I learn how to cope with that I meant other people that or just same as I and some people that were on Prozac the same drugs that I was taking for a long time but now I’m cleaned up and I found Bob Martin now here’s a really good friends that I see I just wish that I could share my life with him I met this girl in the Philippines I wanted to move there so I bought Bob books and there’s a lot to my story but I really can’t tell it and I know they’re Save-A-Lot you know about who I am I’m sorry Bob I didn’t I didn’t know about Chris now I know why you moved back to the USA. I just wanted to let you know that I’m not a smart guy I just had to learn on my own instead of being an institution thank you Bob for writing your storys. I do enjoy reading them. Hi Michael, thank you very much for your comment. I’m sorry about to think you had to go through, but I’m glad that things worked out for you. Thank you for appreciating my writing, and for my books that you bought as well. Take care. Way to go Chris. Keep going forward. You’re doing a great job. Keep up the good work. I’m glad you’re here in Indiana. Thank you, Jack. Chris will appreciate your comment. Great to hear about Chris Bob. Welcome back to the USA. Thank you very much for that, Franklin. You and Tyson opened up a huge door for Chris. He has real new friends now who greet AND TALK TO HIM. He is now SOMEBODY! Its a two way street. Everyday there will be someone new and something new. It’s not created by America. It’s a culture created by Tyson. America is a land of islands with many divisions. You’ve found one that’s intentionally loving and intentionally nurturing Help it spread its attitude and philosophy. 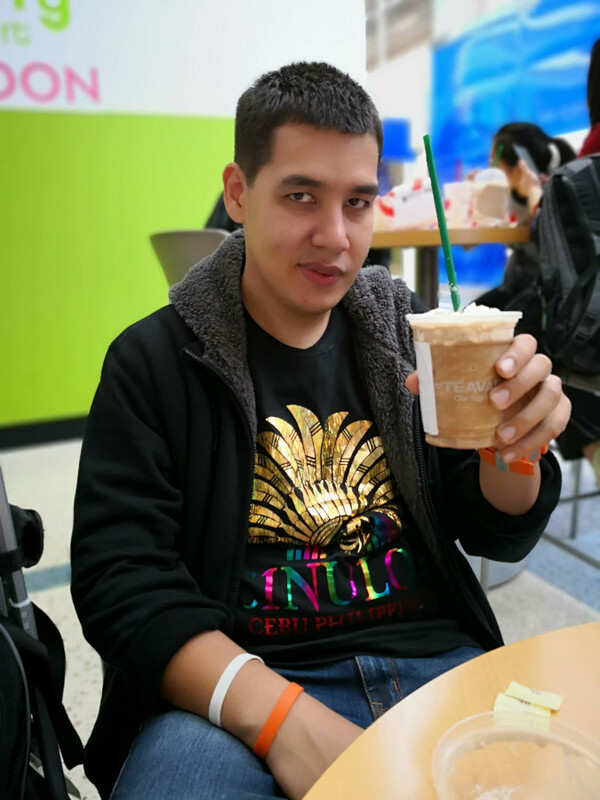 The rewards to Chris are a big degree of independence, money so he has many more personal choices, many real new friends and acquaintances, and life. 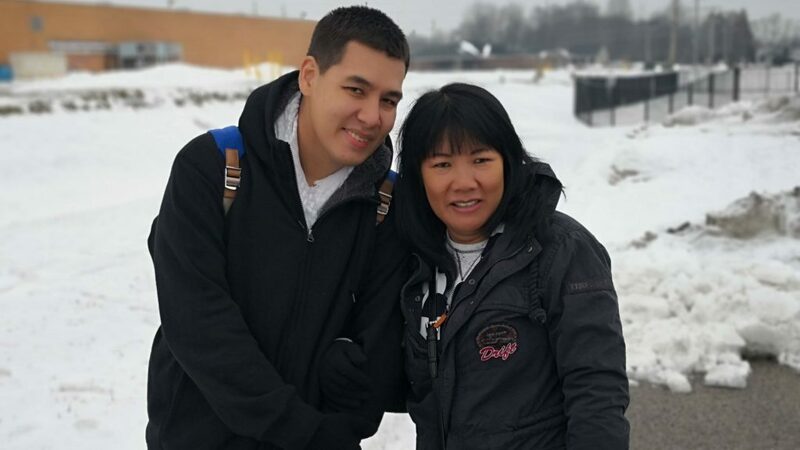 Your rewards are seeing a son where life opens up again, after being nurtured in the Philippines when he was young. Hi Jeff, the rewards are huge for us. Just seeing the development has meant so much. Thank you for your nice comment. Best thing I have read on the Internet in a looong time. I’m sure you are beaming with pride, as you should be. Thank you very much, Neal. That is a very nice thing to say, and I appreciate it. Wow so Happy for you and your family Bob ! What a wonderful story ! God Bless and tell Chris to stay with it ! I raised a step son with ADHD and mentally retarded ! He is 36 now ! There was unexpected ups and downs but tell him to keep his head up and don’t let the downs stop him ! Thank you very much, Turner. I appreciate that, and I also hope that your stepson is doing well! Tears in my eyes as I read this. So happy for all of you. Bob is fortunate to have such a loving family who are willing to do the right things for the kids. Blessings always my friend. Thank you very much Ray. I appreciate you’re very kind sentiments. Well it appears things are working out for the best there, what a wonderful blrssing for y’all. Congrats to Chris on his new job, new friends, and a new life for all y’all. May God bless you more and more my friend. Thank you very much for those kind thoughts. I am so proud of Chris and You guys. 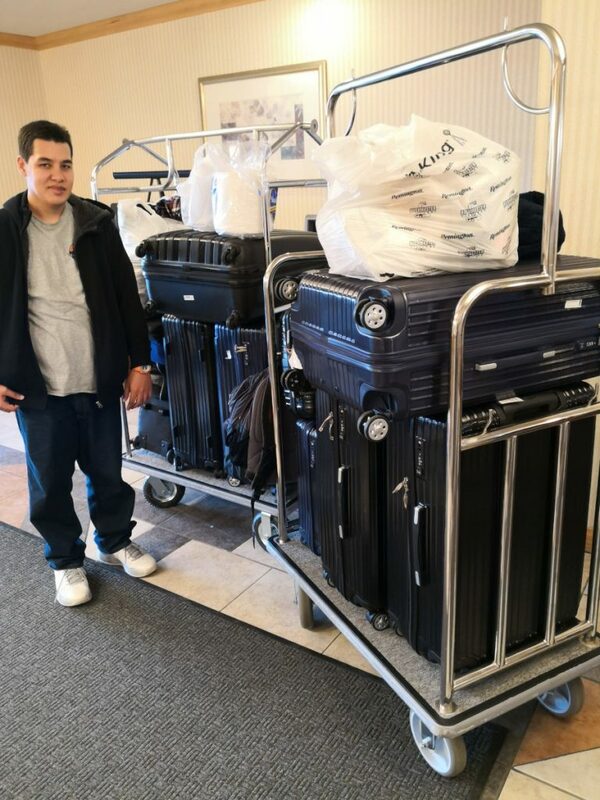 The story was great and you are right, for Chris moving back to the states gives him more opportunities then anywhere else in the world. People with disabilities in the states was once something of a hard issues for workers and well, just about everything else. But now in 2019, companies and bosses have learned that someone with a disability will work 10 times harder and will have more pride in their job then any normal American worker will ever have. Most the average American worker and I see it from all over the US only wants to work as little hours as possible and get paid big money to do nothing. I know that I work with many people with disabilities and trust me when I say it, they are the best workers hands down over everyone else. The pride and excitement they show each and everyday is the best. you made a great choice and in the end Chris will benefit from your family choice to move back. I am sure that Chris as you said will move up the ladder fine. being given the chance to unlock his skills inside will be something that one day he will be able to be on his own and know the ropes of life. On a side note, how are you all doing anyways? Hopefully the weather is not kill’en ya to bad. I have had many people from the Midwest out here in my Napa Valley that came out for tours and to just get away from the cold you all are having back there. Not that its not cold here, and we are getting lots of snow in the Mountains, but anywhere in t he sun and above zero is good for the bones sometimes. Well take care and Happy Birthday Bob! Have yourself a Great Day. See ya soon! We are all doing great. It is very cold here, but we are adjusting! Good on you young man. Thanks, Frank. Chris will appreciate that very much! This is wonderful Bob! You’ve certainly made the best move for Chris and your family. It’s wonderful to hear about that kind of work ethic and pride in a young person, credit to his parents. You must be so proud of your son! All the best to you guys. That was a great story about Chris and why you moved back to the states. I had sent you a voice message asking why you moved. Now I understand. I’m very happy for you guys. Thank you Kevin, yes, I got your voicemail and already replied to you. I’m glad that you understand now.